Biography of German Expressionist Sculptor. One of the greatest sculptors of the early twentieth century, the German artist Wilhelm Lehmbruck ranks alongside Ernst Barlach (1870-1938) as one of Germany's two most important figures in the expressionist movement, and is best known for the pathos of his female nudes, whose forms were inspired by German Gothic sculpture. In his works, figures appear as if rising out of an inner, violent tension, almost enhanced by this very tension. Their movement seems to emanate from their innermost depths. The body is, as it were, cast aside to allow the full radiance of the soul to emerge. Like Barlach and other 19th century German artists, Lehmbruck was also influenced by the symbolism movement, although naturalism and a melancholic expressionism pervades most of his work. Of the two artists, Lehmbruck had the more classical style, but where Ernst Barlach is best remembered for his wood carving, Lehmbruck also excelled at bronze sculpture and marble sculpture, in a variety of sizes, and produced portrait busts as well as statues. In addition, Lehmbruck explored printmaking, producing a quantity of etchings and lithographs. Profoundly unsettled by his experience in World War I, Lehmbruck committed suicide in 1919 at the age of 38. Born the fourth of eight children into a poor mining family in Duisburg, Lehmbruck studied sculpture and decorative art at the School of Applied Arts in Dusseldorf from 1895 to 1899, thanks to an allowance he received from the municipal authorities. After this he began earning a living making illustrations for scientific publications (1899-1901). Then, in the same city, he attended the Fine Arts Academy (Kunstakademie Dusseldorf) from 1901 to 1907. To begin with, he absorbed all the conventions of academic art, but in 1905 he was greatly affected by the expressionist forms of the great French sculptor Rodin (1840-1917), as revealed in Lehmbruck's The Bather (1905) and his later Mankind (1909). In 1906 he exhibited for the first time at the Deutsche Kunstausstellung, in Cologne, and also travelled to England, the Netherlands, Italy and Paris. In 1907 he married Anita Kaufmann, with whom he had three sons, and in 1910 moved to Paris, where he met the painter Henri Matisse (1867-1954), the Romanian modernist sculptor Constantin Brancusi (1876-1957), the Italian portraitist and sculptor Modigliani (1884-1920), and the expatriate Russian Cubist Alexander Archipenko (1887-1964), with whom he became friends. During this time, as well as plastic art - see, for instance, his Standing Woman (1910), created in the classical manner of Aristide Maillol (1861-1944) - he also produced a number of etchings, lithographs and paintings. 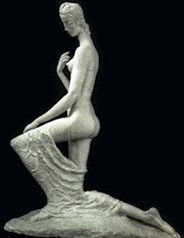 Then came the first masterpiece of his mature style, his stone sculpture Kneeling Woman (1911, Museum of Modern Art, New York), which is filled with feminine melancholy and is the embodiment of humility and piety. Shortly afterwards, he exhibited at the Folkwang Museum in Hagen alongside the paintings of the Viennese genius Egon Schiele (1890-1918). In 1913 Kneeling Woman was displayed at the Armory Show in New York. It was followed by Standing Youth (1913), a masculine form full of power and brooding. The following year (1914), he had his first one-man exhibition at the Galerie Levesque, in Paris. To compare the art of other expatriate 20th century sculptors who worked in Paris before World War I, see: Henri Gaudier-Brzeska (1891-1915), and Jacob Epstein (18801959). Called up into the army during the First World War, during which he served in a military hospital in Berlin, the experience marked him for life, and the suffering he witnessed was clearly relected in sculptures such as Fallen Man (1916, New National Gallery, Berlin) and later in Seated Youth (1918, Stadel Art Institute and Municipal Gallery, Frankfurt am Main, Germany). In 1916, after two years in Berlin and suffering from severe depression, he fled to Zurich, where Dada the anti-art movement was emerging in the performances of Tristan Tzara (1896-1963) at the Cabaret Voltaire, helped by Jean Arp (1886-1966). If Lehmbruck encountered Dada, there is no mention of it. In early 1919, he returned to Berlin where he was elected to the Prussian Academy of Arts. It made no difference: on March 25, 1919, he gassed himself, leaving four children. The largest collection of his works can be seen at the Lehmbruck Museum (Duisburg), designed by his son Manfred Lehmbruck (19131992). It contains some 100 sculptures, along with 900 drawings, 200 graphical works and 40 paintings. A number of the world's best art museums and sculpture gardens also hold examples of his carvings and casts, including the Stadel Museum (Frankfurt), the Museum of Modern Art (New York City), the National Gallery of Art (Washington DC. ), and the Tate Gallery (London). Touchingly, his close friend the architect Ludwig Mies van der Rohe (1886-1969) introduced Lehmbruck's sculptures into his buildings and architectural designs, for much of his career.  For more about German expressionist sculpture, see: Homepage.